Peter Burkholder’s book All Made of Tunes: Charles Ives and the Uses of Musical Borrowing is my bible. In it Peter systematically outlined all the various methods and intentions with which Ives quoted and borrowed from other music. Peter worked from the manuscripts outward, and when he found a folk song penciled next to the symphonic tune Ives derived from it, Ives was caught red-handed. There were many attributed quotes in Ives that I was reluctant to think were intentional, but when Peter shows the notes in the manuscript next to the score, it’s not just persuasive: it’s a mathematical proof. Everything in the book is so closely evidence-based and so judiciously stated that I’ve never found a sentence I could argue with – and it transformed my idea of how Ives composed. I consider it the single most important volume in Ives scholarship. The problem is the book’s aftermath, for which Peter bears no blame. I’ve wondered for decades why academics so often remind me of a flock of birds, in that when one changes direction, they all do, instantly. Or in this case, maybe it was more like the fishermen in the charming Jean Shepherd film My Summer Story, if you know it; when one of them catches a fish, sixty fishing boats in this large lake all converge on that same spot, convinced that where one fish has been found, all the rest must be hiding as well. What the other musicologists should have said, when All Made of Tunes appeared, was, “Man, Burkholder really wrapped up that topic. That’s encyclopedic. Now that there’s nothing left to say about Ives’s borrowings, what else can we study about Ives?” Instead, they responded, “Oh – we’re doing borrowings now! So the way to research Ives is to find all his borrowings. Consider me on board.” They reacted as though Peter’s book had explored only the tip of the iceberg of Ives’s borrowings, when in fact, in one stroke of genius and impressively thorough research he had mapped out the entire iceberg. What we’ve had since, unfortunately, is an ongoing flow of speculative borrowings. Alone of all composers, the name Charles Ives at the top of a score unleashes an Easter egg hunt for all the juicy little borrowings presumed to be scattered within. Peter never speculated: he found the notes in the manuscripts. But some of his successors have blithely matched every three- or four-note motive in Ives with other pieces containing similar intervals. Yet if I inveigh against this indiscriminate tendency, someone invariably reacts in horror: “You mustn’t say that! You’ll offend Peter Burkholder!” This, to me, is a clear sign that they didn’t read Peter’s book. All Made of Tunes draws scrupulous and fine-grained distinctions among the various categories of supposed borrowings: obvious lengthy quotations of well-known tunes; tunes so altered as to evade discovery except that the manuscript evidence is incontrovertible; tunes that we have programmatic reason to think Ives was slyly alluding to; borrowings that have been imputed but can’t be confirmed; and alleged borrowings based on random note-groupings too brief to take seriously. No one seems to have noticed that Peter dismisses dozens of imputed borrowings as not meeting any meaningful set of criteria. His is an elegantly stratified model for how to talk about borrowings without making unwarranted assumptions about Ives’s intentions. I completely agree. And yet musicologists, since Peter wrote that, have crawled all over that theme finding borrowings in every interval. “That’s a descending perfect fifth! Didn’t Schubert use that interval once?” Why don’t we make a list of all the pieces that have ever used do-re-mi, so we can marvel that Ives quoted them all at once? Peter and I are on the same page. I’m the one upholding Peter’s exacting standards and wishing that other writers would show the same cautious self-restraint. Can you hear the resemblance? Neither can I. (Nor is it in Peter’s book.) I’ll admit, the F-E-D# is in there. First of all, since Ives’s theme is propulsive and forward-moving, the rhythmic character couldn’t be more different. The opening tritone creates different harmonic expectations than a leap of a sixth. Then, the essence of Wagner’s motive is that it isn’t a linear theme, but two lines at once, resolving chromatically in opposite directions. Let’s just say that I’ve known the Concord since 1969 and Tristan since 1974, and I was flummoxed a few years ago when I read about this alleged identity. Nothing clicked into place. My composer’s sense rebels at the thought that either of these could be intended as a reference to the other. (If you want to hear Tristan brilliantly reworked, listen to the hilarious Scherzo Mortale of William Bolcom’s Fifth Symphony.) More importantly, the writers who so confidently assert this identity never cite any Ives manuscript containing a sketch in which Ives transforms the Tristan motive into the Fugal theme, and so (having looked through all the relevant sketches myself) I have to assume no evidence has been found indicating this was Ives’s intention. Moreover, for the musicologist, the identification of the source borrowed from is the end of questioning. The composer, though, still has as many questions afterward as before. “Why did Ives write that sequence of notes?” becomes, “Why did Ives borrow that sequence of notes?” If Ives really thought of this as a quote from Tristan, what’s it doing running through the ferociously dense fugue in a movement about Emerson? What does Wagner’s ode to sensuousness and longing have to do with a philosopher as unsensuous as Emerson, a man perennially declared incapable of intimacy by the women in his life? Even supposing Ives did twist the Tristan motive into this, what would knowing that add to our experience of the Emerson movement? What do we gain from trying to keep in mind that somehow Ives is making a point about Tristan, or Wagner, or forbidden love in the middle of all that frenetic counterpoint? The cognitive dissonance makes my head hurt. Maybe Ives was thinking about Tristan when he wrote that, and maybe Keira Knightley longs to throw herself into my arms, but without evidence both propositions amount to no more than wishful thinking, and shouldn’t be stated as fact. I think it has something to do with knowing how composers think. Peter started out as a composer, and he has a sound sense for what a composer’s thought process would be. One thing I admired about the late Wiley Hitchcock was that he lived his life among composers, knew many intimately, and could always talk about composers with authority. Musicology, though, has become such a successful and self-contained discipline that its practitioners can now afford to live in a bubble, and I feel that in many of their books these days, composers are misrepresented. Our motivations are caricatured. Musicologists often do pretty well with music that can be described in strict terms, like Webern or early minimalism. But the Concord is a huge, paradoxical hybrid, a sprawling Romantic sonata made of modernist materials, with collage elements and the occasional vestige of sonata form, intermingling atonality with the most conventional tonality. No one tool will do: the analyst must have forty techniques at his disposal, and a sensitivity for when to switch from one to the next. I submit that it takes a composer to do it justice. Analyzing music is what I do for a living. I teach courses in analysis of 20th-century music, and every year I add several more pieces to my repertoire. Where the musicologists only have a hammer, I have screwdrivers, blow-torches, tweezers, crowbars, drills, a set of graduated socket wrenches, you name it. Now you may think this looks as far-fetched as the Tristan theory, but we happen to know that Ives liked to plant hidden retrogrades in his music (I have a nice Concord example I’ll tell you about sometime). We also know that one of his most frequent methods of varying a melody was to slightly alter the interval sizes; Lora Louise Gingrich, in her fine 1983 dissertation “Processes of Motivic Transformation in the Keyboard and Chamber Music of Charles E. Ives,” found this technique so pervasive that she invented a quasi-mathematical notation to express the variations in. So we know this explanation stays within Ives’s habitual practice. I find that one can even start to hear the relationship once it’s pointed out. The Fugal theme’s ensuing notes merely continue with a pentatonic fragment common to most of the Emerson-movement themes. I don’t have evidence that Ives created the theme this way, so I don’t state it as fact. But the relationship among those notes is a fact. This is not coincidence, nor simply interpretation. 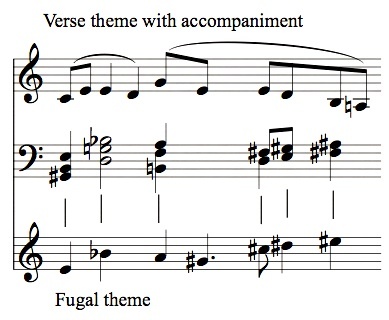 The intervals of the Fugal theme are outlined by the harmonies that repeatedly accompany the Verse theme – and those chords don’t suggest anything Tristanesque. The question is, did Ives write this accompaniment to the Verse theme and then derive the Fugal theme from it? Or did he write the Fugal theme and then cleverly slip it into the harmonies underlying the Verse theme? I don’t know. I haven’t found any evidence in the manuscript that would solve this chicken-and-egg puzzle. But I have succeeded in relating the anomalous Fugue theme to both the Human Faith theme and the Verse theme, thus giving it a purely musical justification based in clearly evident note-patterns, and I don’t have to bring Tristan und Isolde in as backup. This explanation also makes me more impressed with Ives’s ingenuity than the Tristan speculation had. No previous book or article, as far as I’ve been able to find, has ever drawn out these relationships I’ve just outlined. Well, I quote heavily from three scholarly books about Ives published in 2013/14. And you can see how this works: one writer speculates; another, trying to get tenure, having to be congruent with his colleagues or his external reviewers, trying to get published, is forced to agree, to cite; a third is pressured to flatter the first two, and eventually the academic consensus floats away from any mooring in reality. So I come along, trying to correct musicologists’ errors, replace their fanciful speculations with arguments grounded in textual evidence, and infuse my narrative with a composer’s sense of why Ives would have done what he did. And for four years, the musicologists have denied me grants, condescended to me and insulted me in their readers’ comments, and patronizingly tried to teach me how to do musicology. And since they have done what they’ve done from behind the screen of anonymity, I can only answer in public. I will not do in my book, but I have done here in my blog, what they asked. I have engaged – I have grappled – and I am finished. What I can’t understand in your discussion of the post-Burkholder search for tunes that Ives borrowed is why those who’ve come after Burkholder are limiting themselves to music composed before Charles Ives began writing music. We all know that Ives was a visionary who was far ahead of his times, surely he was well aware of a wide range of music from the 1950s, ’60s, and beyond. I have heard many instances where it is extremely clear that Ives borrowed from Vicki Bennett, Ornette Coleman, Grandmaster Flash, Marvin Gaye, Robin Holcomb, Wayne Horvitz, Lennon & McCartney, Joni Mitchell, Prince, Ruth Carter Stevenson, Lucinda Williams, Brian Wilson, and many, many other composers working during my lifetime. Soon I will begin examining the post-Burkholder literature on Ives’ borrowings for appropriate citations, so that I don’t run into the same difficulties that you’ve been having with peer review. Because, in the same way that Ives himself composed, I am not a full-time musicologist, I will have to write this study when I am not otherwise employed with my job. If you don’t mind, I hope to continue posting updates of my research on your blog in lieu of mailing my documents to myself to copyright my book and to insure that no one steals my ideas. KG replies: I can help: I can give you a list of *my* pieces that Ives quoted from. Thank you so much, Kyle. I did not dare to suggest this and I very much appreciate your interest. Herb: you’re absolutely right! However, the more common academic wording is that Ives anticipated these great artists. The example I always like is that Young’s X (Any Integer) for H.F. anticipated Stockhausen’s Klavierstuck IX. Naughty La Monte, stealing prospectively from Karlheinz (believe it or not, an academic at one of my grad schools in the 1980s said as much). These Ives posts are stunning. You’ve taken this non-specialist on a guided tour thorough musical realms I’d always thought beyond me. You’ve expanded my modes of apprehension. KG replies: Lyle, I’m afraid I have taken you down into the pits of academic hell. But I imagine it would be an informative trip. Just be glad you’re not a musicologist. I agree with Lyle that your Ives posts are stunning! I’m wondering why the reviewers weren’t composers rather than musicologists – people who might actually understand what you’re doing. Whatever format your Ives book eventually takes – whether the publisher comes through on your terms or you decide to self-publish or do an online version – this Ives book needs to be out there. I find it very tedious to read the same thing and see the same citations in one piece of scholarship after another, whether it’s in the music world or the neuroscience world (where I increasingly spend my time). Whatever happened to valuing critical thought? KG replies: When reading the academic literature, I do run into so many quotations I already practically know by heart that I’m always skipping paragraphs because I know what they say. It’s making me more reluctant to quote very much. This post is so damn wonderfully written, I’d like to throw myself into your arms! KG replies: Well sure, Keira, you say that *now*. An excellent article Kyle, I read it carefully and it has helped clarify some of my views. My wife – a moviment consultant – was asked to contribute a chapter to an academic book here in the U.K. as they wanted someone who knew about practical work. The politics were terrible: writers were deliberately omitted to snub them; writers were brought in to irritate the ones who were snubbed; two academics got of the underground at the same time and entered the university by different doors so they would not share a lift; people in the same office refused to talk to one another; and on and on. On top of that each contributor was giving a list of cultural theory concepts that they should include. Apparently when under fives play on the floor, grab a ball or dance, there is a whole load of concomitant gender issues, social constructs, reception theory, transgender issues, deconstructionism etc. And she thought she was teaching moviment. KG replies: I read and enjoyed his Therapy. I’ll try that one. Have loved reading your recent posts about Ives. Has helped me understand his music better and inspired me to listen to more of his music. Been listening to his Violin Sonatas recently – thanks to you. Will read your upcoming book. One critique of your recent posts – why so much academic bashing? You don’t like them or respect their scholarship. You’ve made that clear. But, it adversely impacts your scholarship by constantly interspersing comments about how foolish and misguided they are. Every other sentence shows your disdain for the current state of musicology. It’s distracting. Wish you’d write a post bashing them to your heart’s content. Unleash. Then leave it at that. How much time and energy do you want to exert on a group you don’t respect? KG replies: These people are trying to prevent my book from being published, not, as they admit, because what I have to say is untrue or uninteresting, but simply because they want to control the content. As soon as they leave me alone, I will leave them alone. You had me at “Jean Shepherd”. Wow.